We had family come to visit last Sunday week, and were just planning to duck out to Woollies to pick up something for lunch. Then I realised that was a bit stupid – we have lots of nice butternut pumpkins (butternut squash to the North Americans) in the garden, it was a rainy day, and pumpkin soup would go down a treat! Pumpkin soup is great for impressing visitors. It’s so easy to make, it’s easy to grow all the ingredients you need, and it tastes amazing compared to the bought stuff. 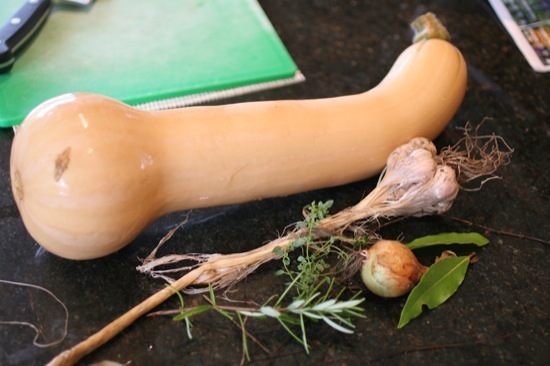 A quick scoot around the garden yielded this elongated butternut pumpkin, an onion, thyme, rosemary and bay leaves. Most of our butternuts are the usual short fat variety, but we get a few long ones like this each year. I had garlic hanging in the garage from our last harvest. I also later went back for some sage. In the freezer I had some chicken stock from when we killed Roger the rooster. I like to oven-roast the pumpkin before adding it to the soup – it gives a richer, more interesting flavour. Just peel and dice the pumpkin, and roast it on a tray in a moderate oven until it browns a little. While the pumpkin is roasting, dice one or two onions. Gently heat some olive oil and butter in a big saucepan, and add the onions to soften. Add the chopped garlic to the onions, then tip in the roasted pumpkin pieces and give it all a quick stir. Add enough chicken or vegetable stock to completely cover the pumpkin – you can add more to stretch the soup further if more guests turn up unexpectedly! If you don’t have stock on hand, you can use salted water. Add the bay leaves whole, and chop the rest of the herbs finely before adding them. Simmer for a while to let the herb flavours develop. Just before you’re ready to serve, remove the bay leaves and use a stick blender to puree the soup. Keep going until there are no pumpkin lumps left. As a last touch, season to taste with salt and freshly-ground black pepper. Serve into soup bowls and dress with a dollop of sour cream or natural yoghurt and a garnish of parsley. Sorry, but I forgot to take a photo of the finished product! If you have the time, some fresh-baked bread rolls go really well with a soup like this. A nice sourdough from your local bakery is lovely too. Hi Darren, I think you gave your family the best meal…nothing could possibly compare to walking out to your garden, selecting some home grown produce and making it all into a lovely meal….well done…wish you had a photo of the finished soup though….but I bet it was too yummy and went in to bellies to quickly for a photo. Well done. @NellyMary: Hehe, yep, once it was ready nobody wanted to wait while I stuffed around taking photos! Virtually the same recipe works really well with chokos, too, which are just starting to fruit in our yard. It’s probably the only way I actually like chokos :-). wow, Choko soup…would never have thought of that one…I only use them for preserves..and the occasional steamed veg….but soup…I am definitely going to try this one…Thanks for the idea…Now I just have to wait for my choko’s to grow a bit bigger…..Hey, did your choko vine nearly die off then get going again….I didn’t think it was ever going to produce fruit….but last few weeks it has gone nuts. I nearly pulled it up a few times…glad I didn’t now. Wish I had space to put Jam Melons in too…do you grow Jam Melons? @NellyMary: Choko soup is super simple and surprisingly tasty. Let me know how it goes (I’m sure I’ll see it on your blog if you make it!). Yep, my chokos struggled for a long time, and have finally taken off in recent weeks. One went straight up a gum tree – I’ve no idea how I’ll get the chokos if it keeps climbing! I haven’t tried (or even seen) jam melons – they sound interesting. hey Darren, thanks heaps for the location of the lillypilly….I picked 20L today….now I just have to source some good lillypilly recipes… thanks again for sharing….I had a few onlookers…lol….and a few locals asked what I was going to do with the berries…I told them to try one…and they all learn’t something new today…no-one knew you could eat them, let alone make jam. @NellyMary: Glad to help! I’ll be watching your blog to see what you do with them! When we eventually catch up, I’ll have to get some Jam Melon seeds off you. They sound interesting. Choko soup is good, but chokos sliced and stir fried so lightly that they are still crunchy, with salt, pepper and a little butter – yum. @Linda: My mum gave me a couple of chokos tonight, as luck would have it. I think I’ll give stir frying a go – I haven’t tried that before. By the way, your apple oat slice looks delicious – I think that’ll be on the cards this weekend too! Sounds like a very nice receipe. Can you believe were on school holidays again. Have just come off 3 weeks work with the election. So catching up on all my great blogging freinds blogs. Donna. A few more ideas on the choko thread… My family are big choko fans. We love them baked and BBQ’d, but the easiest way to cook them is probably our favourite – steamed. When they are soft, drain the water and just add a little butter and steak spice. For us, they make a meal on their own. I must say, after peeling them, I hate the feel of the residue on my hands, so that puts me off a little! My father, Bob, has grown chokos and supplied the neighbours with them for years. I understand it’s normal for the vine to die right off over summer, and come back to life with a vengeance at this time of year. His vine takes over his whole back garden, growing over everything, including the garden shed, and yes, harvesting the produce is occasionally problematic because of where it chooses to grow! @Paula: Bob’s chokos are legendary in the neighbourhood! 🙂 In fact, I think some of our plants were grown from some of his fruits. I’ll have to try the butter and steak spice – sounds good. My mum uses surgical gloves when peeling large batches of chokos for soup, to avoid the sappy residue problem.